Fatal Love: South Asian American Art Now offers an examination of the work of some of the most important, engaged and emotionally charged artists working in the Northeast United States. Presented in conjunction with Edge of Desire: Recent Art in India, a major survey exhibition that the Queens Museum is hosting with the Asia Society, Fatal Love features contemporary photographic, print, video, web-based and installation works by 28 emerging and established American artists of South Asian descent. With a particular concentration on New York City – the current nexus for avant-garde South Asian cultural production and visual art – Fatal Love captures an important moment in South Asian American art; a moment of change, focus and redefinition. Before September 11 most of the artists in the community were concerned to reconstruct a diasporic identity and challenge an imposed politics of representation. Since September 11 many artists have been concerned to confront, challenge and undermine the distorted and limited presentations of South Asian communities that are too often presented by the media and the government. It is a move from an art that seeks to define an identity for the community to an art that seeks to resist a false, imposed identity. For some artists this has meant using art to make injustices public, whereas others are making public the intimate or hidden aspects of highly reified identities in order to reclaim nuanced individualities. Also, because of tumultuous political state of the subcontinent, diaspora artists are again considering the ways in which the legacy of South Asia’s Independence and partition is manifest both in the local (US) communities and “back home.” The topical nature of these experiences will be explored throughout the exhibition. 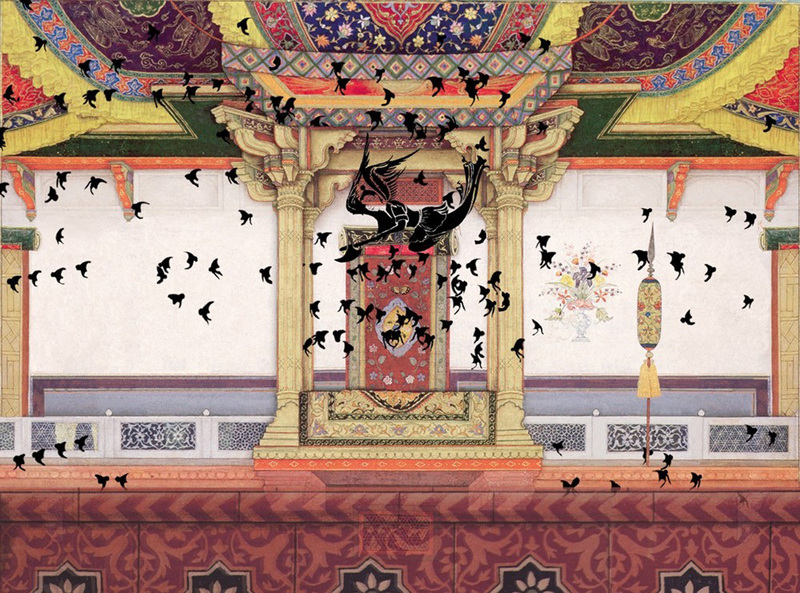 Participating artists include Dhruvi Acharya, Rina Banerjee, Siona Benjamin, Anna Bhushan, Iftikhar and Elizabeth Dadi, Mareena Daredia, Safia Fatimi, Chitra Ganesh, Indira Freitas-Johnson, Farheen Haq, Mala Iqbal, Vandana Jain, Swati Khurana, Bari Kumar, Annu Matthew, Naeem Mohaiemen, Nitin Mukul, Prema Murthy, Pratima Naithani, Yamini Nayar, Ibrahim Quraishi, Saeed Rahman, Sa’dia Rehman, Ela Shah, Asma Ahmed Shikoh, Shahzia Sikander, and Jaret Vadera.